Our appointment with Dr Sweeney went well on Wednesday. I’m healing just fine and pretty much back to normal after surgery. Everything is in place as it should be. The shot wasn’t too bad. I expected to be sore afterwards but, no pain at all. The best news however came when the ultrasound tech asked us if we wanted to know what we were having. We said yes in unison and she informed us that she would try but at 16 weeks, it’s still pretty early. First things first, she needed to check all of babies limbs, organs, etc to see how they were working. It’s amazing to me that you can actually see their kidneys working! Modern medicine is amazing! After we were reassured that baby was measuring on target and at this point all systems were working as they should, she began the search. It didn’t take long, as baby was very cooperative. And there it was. I believe Chris’s exact words were “I see it”! We began to laugh and then the tears started to flow. I looked over to see Chris’s eyes all red and filled with tears. He got up and kissed me and I could just see how incredibly happy and filled with joy he was in that moment. I could sit here and say it didn’t matter boy or girl, we just want a healthy baby. And that is true. The baby’s health is most important. However, rewind to 2 years ago, finding out we were having a boy, preparing for him, all the hopes and dreams you start to think of for him, all taken away in a blink of an eye. So yeah, when they told us that this baby is a boy, it was like a second chance. My husband was going to get to make memories like all dads dream of making with their son and have his last name carried on. And by no means is this baby boy a replacement to Cameron. That could never happen. Cameron’s legacy is so strong and powerful in my heart and Chris’s heart it could never be replaced. Everything that I do and all that I am today is because of our little angel, positivity, prayer, and a higher power. Cameron changed our world and something in me says he had a hand in bringing us his little brother. I just feel blessed. This baby is more than just our little boy. He’s our miracle. He’s hope, love, joy, strength. He is life. Many of you may not understand what I mean. But if you’ve ever stared death in the face and ultimately realized or grasped what it means to be alive, you may understand. A year ago this Monday, I was given that horrible diagnosis of CANCER. The scariest time of my life. So many aspects of my life and future hung in the balance. So to be here where we are today, blessed with a baby, the most precious gift life could give. Wow! I know that I will never take any of this for granted because I am fully aware of how fast it can all disappear. For now, I will live in this moment of happiness and the joy of being pregnant. This entry was posted in Breast Cancer, Healing, pregnancy after treatment, Recovery and tagged baby boy, hope, joy, Life by surviveber. Bookmark the permalink. Amber you have the wisdom that only comes with old age, wrapped up with the experiences from several lifetimes, and the wonder of a child. You’ve learned and experienced so much in your 27 (?) years on this earth. I know somehow this path was meant for you to follow …keep this light inside you going, for not only does it light your way but others sense it and it gives light to their way. I will keep your family in my prayers every day. I’m so looking forward to meeting this little guy! Amber, I too feel blessed. 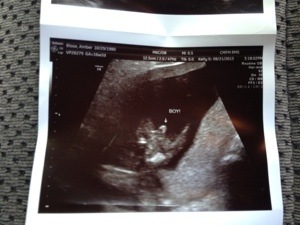 I am blessed to have a beautiful Grandson on the way. I am blessed with the joy and the sorrow ofhaving Cameron in my life for the short but sweet time. I am blessed for having you and Chris in my life. And I am especially blessed for having one amazing, incredible awesomely strong woman in my life that I can proudly call my Daughter. I love you with every fiber of my being. I am so happy for you and Chris.